Nasty Berry Series E-Liquid uk - Official Aspire. 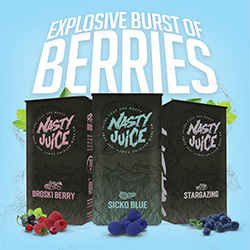 Nasty Juice have unleashed 3 epic new flavours as part of their all new berry series range. Official Aspire are proud to stock this juice and offer it to both retail and wholesale customers at amazing prices. All new 60ml bottle design contains 50ml of the perfect E-Liquid making it Nic Shot ready. So what are you waiting for - lets get Nasty Berry ! !